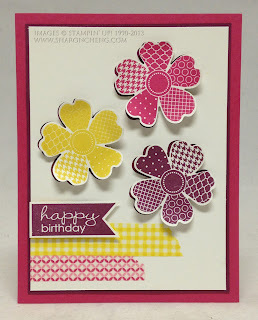 Washi tape, one of my favorite products in the new Stampin' Up! catalog, is used in all of these projects from our demonstrator swap. This treat holder was made by Christi Beck. It holds two Ghirardelli chocolates. 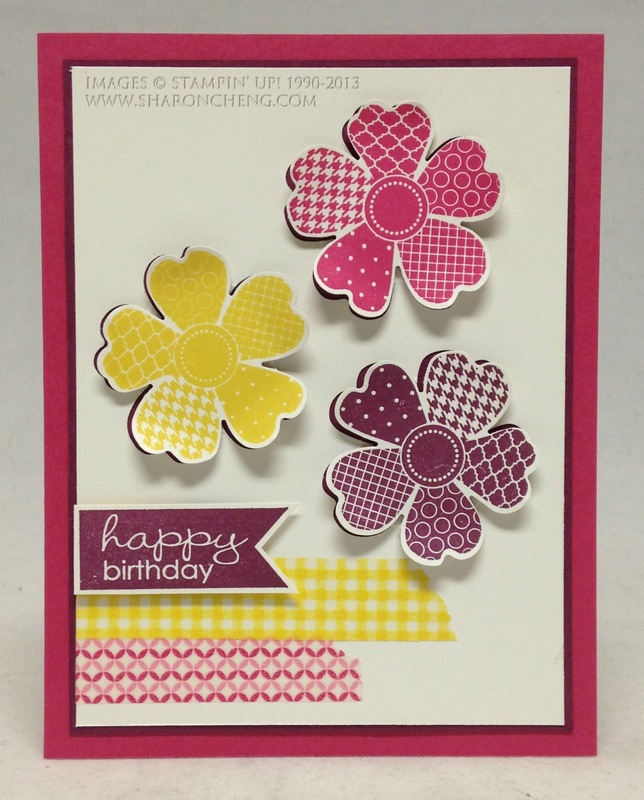 This close up photo shows how Christi used the floral tape from the Gingham Garden Designer Washi Tape set (129314 $4.95). I also like the combination of the Artisan Label Punch (130920 $15.95) and the 7/8" Scallop Circle Punch (129404 $12.95). Here are the three different designs in the Gingham Garden Designer Washi Tape set. 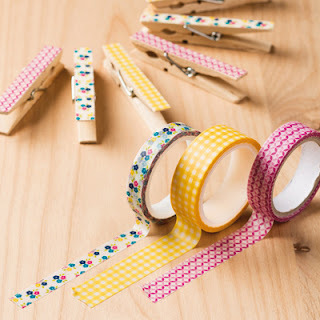 You can see in this photo how easy it would be to decorate clothespins with Washi Tape. Cindy Peterson make this card using the Gingham Garden Designer Series Paper (129310 $10.95). The coordinating colors are Daffodil Delight, Island Indigo, Melon Mambo, Pear Pizazz and Whisper White. This is the card I made for the swap. You can get the details in the post right before this one. Washi Tape first became popular in Japan. It's a decorative tape that can be easily torn or cut. The tape is repositionable and can be moved if you do it fairly quickly. 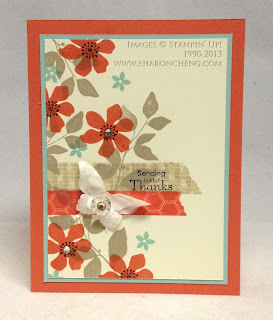 Once again, I love how Stampin' Up! coordinates its Washi Tape and Designer Series Paper. 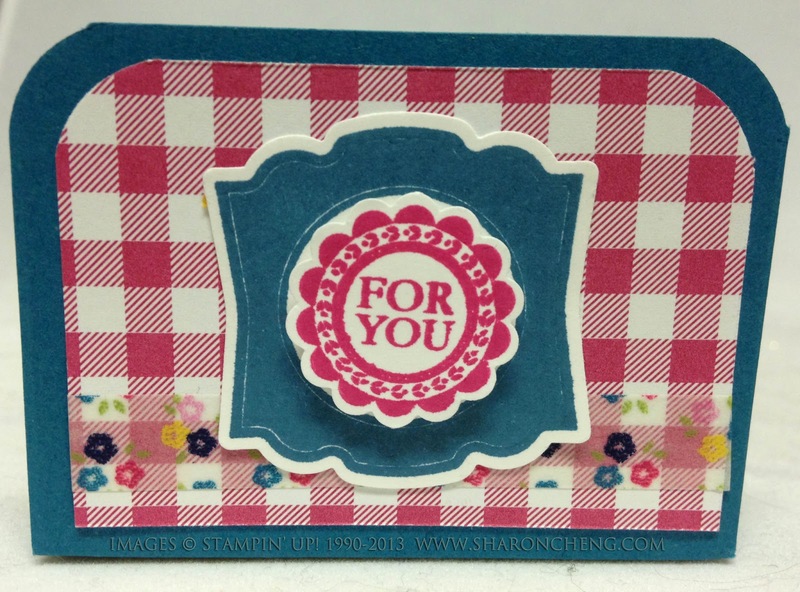 The Gingham Garden Designer series is an early popular front runner from the new Stampin' Up! catalog. 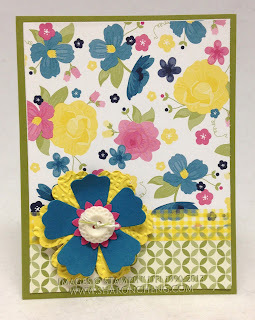 This is another card that I made using the Epic Day This and That Designer Washi Tape. When you stamp on Washi Tape, I recommend using Stazon ink.